This is the first in a series of jewelry artists' portraits I will be sharing with you over the summer. I am never happier than when I meet artists - their passion is infectious and they have a way of bringing a moment of beauty in the day. A couple of months ago I was privileged to attend "Bijoux", an annual jewelry event hosted by the Norton Museum of Arts in West Palm Beach. It was a great opportunity to discover new artists. 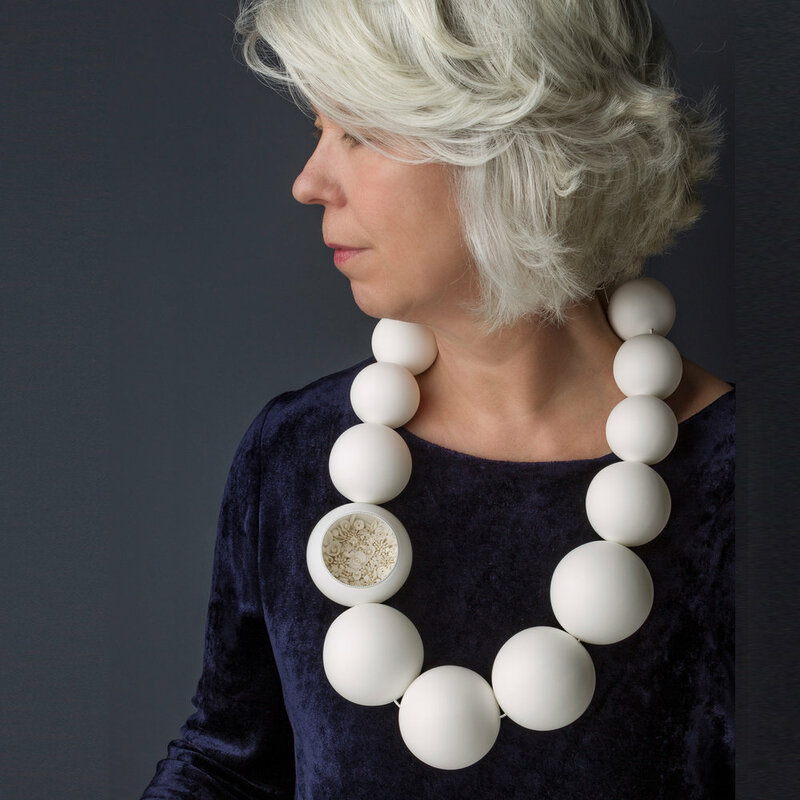 My first portrait is of Ute van der Plaats, a German artist who works with porcelain. Have you noticed how an artist's personality and persona often mirror her art? Ute is soft spoken, gentle, all in nuances and yet you sense a great calm, inner strength, determination in her. Her jewelry is just the same - it's quite remarkable. Porcelain is one of the most challenging material to work with: it has a mind of its own and you just never know what will come out of the kiln. It takes months of experimentation (and limitless patience) before attaining a satisfying result. In her latest collection she challenges the traditional view on pearl jewellery. Pearl jewelry has a long history that goes way back to ancient times. It has always been a part of personal adornment in many cultures. But in the field of art jewelry it is considered of limited interest. 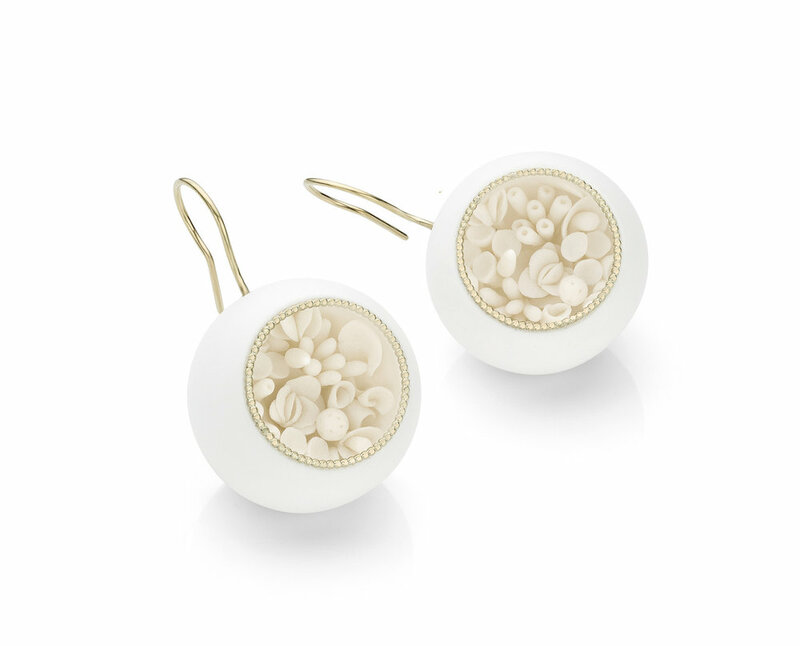 By playing with unconventional sizes of the pearls and using porcelain as her main material, Ute chooses a contemporary approach in order to command a new appreciation for pearl jewellery. Have you noticed how an artists' personality and persona often mirrors her art? Ute is soft spoken, gentle, all in nuances and yet you sense a great calm and inner strength in her. And her jewelry is just the same - it's quite remarkable. Ute wants you to slow down and take the time to really observe the necklace – come close to see the minute garden she has hidden inside one of the oversized spheres and get lost in it. It is as if Ute intended to shrink the space between the wearer and the observer to create a moment of corporal intimacy. The secret garden is an allegory for the inner life each of us carries. Ute readily admits that her work is meditative – it takes 5 weeks to make a necklace and almost 2 years to create a new collection. Some of her gardens are transfers she designs on her computer and then applies by hand after the firing of the porcelain - they have a Japanese ink-writing quality that complements perfectly the pure white porcelain. 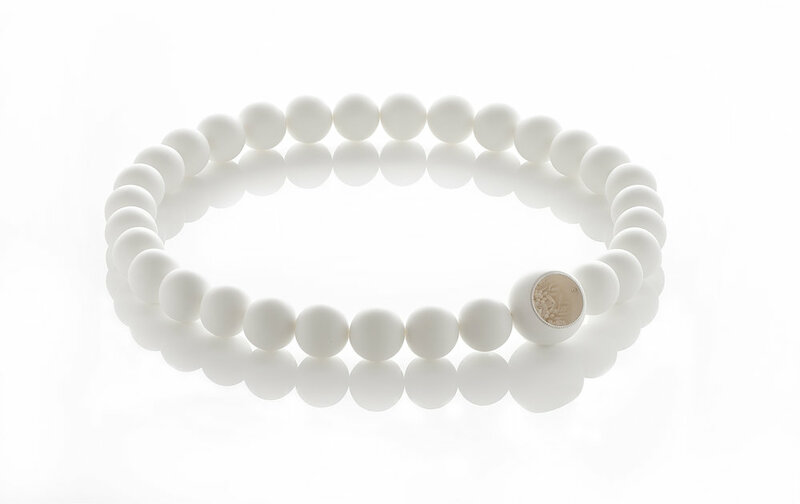 I fell totally in love with the mix of white porcelain and sterling silver - so as you might expect, a piece from Ute is next on my list to add to my collection.